Learn to create your own songs! Honest Guitar: Practical Theory is the simplest way to learn what you need to improvise and create music. Don’t waste hours of your time watching a video of some guy playing the same chord over and over. Learn it and get on to the next skill. After a decade of playing and teaching guitar, I have found that most players become stuck at a beginner level. They strum just as well as a pro and can even play with speed, but they don’t know what’s going on. Creating a song from scratch is beyond their skills and improvising is impossible. Get to the next level. The level that others notice. They’ll make excuses why they’ll play other people’s songs the rest of their lives. You’re better than that. Learn what you need without the fluff. 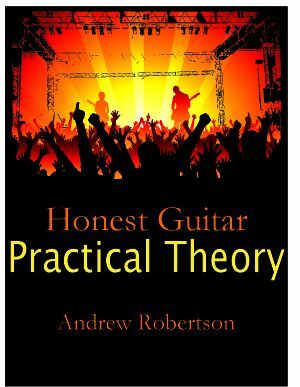 Download Honest Guitar: Practical Theory and get started now!